· This program meets continuing education requirements for Administrators and Alternates under Texas HCSSA licensing regulations. 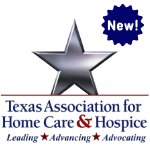 · Texas Association for Home Care & Hospice is an approved provider of continuing nursing education by the Texas Nurses Association - Approver, an accredited approver with distinction by the American Nurses Credentialing Center’s Commission on Accreditation. Program Description: Researchers have found “violence against health care workers accounted for nearly as many injuries as in all other industries combined, which is four times greater than the average U.S. worker.” In this session, we will discuss the current workplace violence risks facing you, your staff and your patients. Attorneys Anthony Cutrona and Richard Pecore will cover strategies for responding to incidents of workplace violence. Participants will learn about the prevalence of workplace violence incidents in health care, about the typical profile of a perpetrator of health care violence, and about the importance of staff training regarding workplace violence prevention. Participants will actively engage in the learning activity and indicate an intent to change or enhance their practice by implementing reporting programs that will encourage healthcare staff to more readily report incidents of violence. Richard B. Pecore is a licensed Texas attorney with over 20 years of experience. Mr. Pecore is a graduate of the University of Texas and South Texas College of Law Houston. Mr. Pecore joined Liles Parker as an associate attorney in January 2012 and became a partner with the firm in February 2016. Mr. Pecore has worked on a variety of health care related matters, and the past 6 years focusing on Medicare and Medicaid administrative provider appeals and creating provider regulatory compliance plans. Since joining Liles Parker, Mr. Pecore has focused on “big box” Medicare and Medicaid overpayments. He has successfully defended overpayment cases ranging in value from $15,000 to $6 million dollars. Prior to joining Liles Parker Mr. Pecore owned and successfully operated an OSHA workplace safety training and custom video company in Austin, Texas. Mr. Pecore is a Certified Medical Compliance Officer with PMI, is a member of the American Health Lawyers Association. Mr. Pecore lives in Kingwood, Texas. Anthony Cutrona began practicing home health law as general counsel for a Houston home health agency in 1996 and opened his solo health law practice in 1997. In 2000, the Texas Association for Home Care named him its Associate Member of the Year. Last year, after 20 years of representing home health care providers throughout Texas, Anthony joined Liles Parker as a Partner and opened its San Antonio office. He continues to represent home health agencies in license and survey matters, administrative appeals, implementation of compliance programs, employment issues, and defends nurses in Board of Nursing matters.